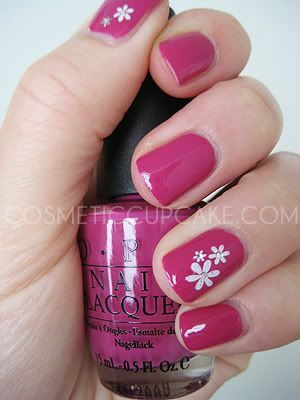 Well here is my manicure from yesterday using Dim Sum Plum from the OPI Hong Kong collection. When the collection 1st came out, I wasn’t interested as I’m not a big fan of OPI as I find it chips very easily on me and at $20 a pop definitely not worth it. Then the thought of trying a collection inspired by where my family is from (which also happens to be one of my favourite places in the world!) took over and I looked up the swatches and just fell in love. Dim Sum Plum is absolutely GORGEOUS!! It’s a rich plum colour which looks fantastic with anything. I love it! It’s very pigmented so you could probably get away with only1 thick coat, however in my manicure I used 2 coats. Keep in mind that the colour can look different in different lighting. The pro wide brush made it super easy to apply and it just glided onto my nail. It also required very minimum clean up which is always great as it cuts down time for someone as time poor as me! I then used flowery nail stickers from Pink Fin for some quick nail art. I’m definitely going to add more OPI to my nail stash after trying this collection! @misskitty: Welcome back! Yeah it's just such a pretty colour just like all the other colours in the HK collection. I'm glad you like it!